1 of 3 Heat grill or grill pan to medium-high heat. Heat oven to 400 degrees . Wrap hamburger buns in foil and place in lower part of oven. Bake 10 minutes. 2 of 3 Meanwhile, in a large bowl mix together the ground beef, Worcestershire, garlic powder, salt, Italian seasoning and pepper. 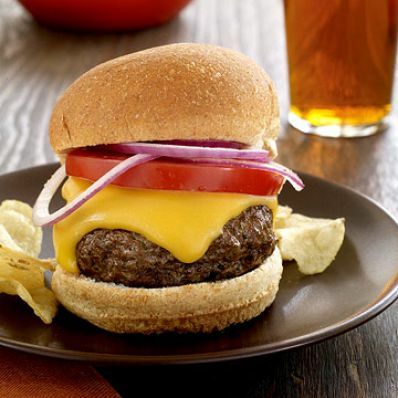 Shape into 6 patties and grill 3 minutes. Flip burgers over and grill another 2 minutes. Top with cheese slices and cook 1 minute more for medium. 3 of 3 Transfer cheese-topped patties to warmed hamburger buns and add sliced red onion and tomato. Serve with ketchup and mustard, if desired. Per Serving: 4 g Trans fatty acid, 28 g carb., 308 kcal cal., 30 g pro., 755 mg sodium, 4 g sat. fat, 10 g Fat, total, 60 mg chol.